Dennis D. Jamiolkowski ​Innovations in absorbable polymers and their applications in implantable medical and surgical devices. ​Developed and standardized the Electrospray Mass Spectrometry (ESMS) technique used in biomedical research, proteomics and the pharmaceutical industry. * ​award accepted by Barbara Reif, daughter of John. ​Patented work on novel small molecules, including a pioneering drug portfolio for treatment of lymphoma. 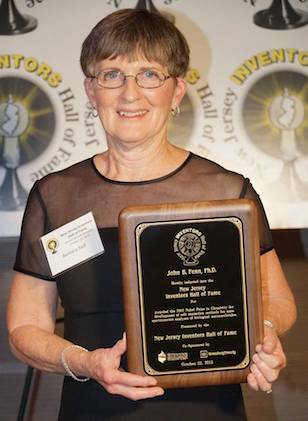 ​Extensive patents and lifetime achievement awards in audio, visual and automation technologies. 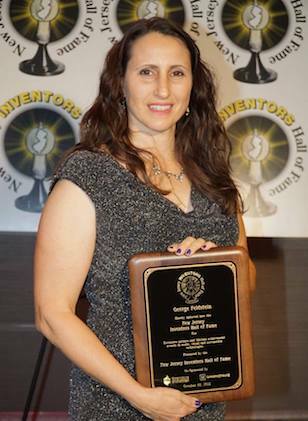 *award accepted by Wendy Feldstein King, daughter of George. In recognition of a world-renown career and leadership role in promoting all facets of STEM education with an entrepreneurial spirit. Lifetime achievements in electroplating methods and developing synergistic coatings used in prestigious agencies such as NASA. Indispensable patent on multi-pin electrical connector for telephone cords. Bred a hybrid peach resistant to environmental adversity while advancing the fruit's characteristics, enabling NJ to be a leading state in peach production. Invented design techniques for content distribution networks (CDNs), which are key to today's delivery of internet multimedia. Innovative patents on printing inks designed for faster and more efficient processing in commercial fields. Formulated an ultrashort-acting drug (Cleviprex) that controls blood pressure by relaxing the muscles of heart and blood vessels. Invented the widespread communication system that uses the internet to make phone calls. Enhanced telecommunication and imaging industry with numerous inventions in optics, materials, sensors and systems. Developed a novel technique to significantly reduce Salmonella poisoning by pasteurizing eggs with radio frequency heating. Innovations in particle engineering for selective properties and their applications in electronics, energy, food and the pharmaceutical field. Peter Lobel, Ph.D. and David Sleat, Ph.D. Innovative work on an enzyme replacement treatment to battle Batten disease, a rare yet fatal childhood disease. Invented ingenious mechanical devices across many fields. Lifetime of pharmaceutical work resulting in new drug patents and treatment methods. Delivering more than a dozen clinical candidates in cardiovascular, pulmonary and metabolic diseases. Developed an online tutor to serve math students' needs through a declarative problem solving approach that provides comprehensive feedback. Created and sustained the "Super Science Saturday" extravaganza to expose children to the marvels of science. Multiple patents on improvements in pearlescent and other metal oxide coated pigments that provide more vibrant, lustrous colored shades and optimal control of color and opacity, with applications in plastics, automotive and architectural coatings, ink compositions and cosmetics. Continuous research on tissue-engineered constructs and microfiber networks in vasculature to push the limitations of autografts. Co-patent holder for Optimized Ontology Based Internet Search Systems and Methods, making Internet searches more accurate. Co-invented Concealed Fastener Window Wall Assembly, which incorporates structural mullions as an internal part of windows, imparting energy efficiency. Invented Software Defined Access (SDA), a novel control path enabling seamless mobility of flow, users and services across different wireless networks. Created a perfusion culture device to help model ex vivo 3D tissue and tumors for various clinical and research applications. Developed innovative strategies for use of gold nanospheres, which attach to tumors and act as a photosensitizer in photodynamic therapy for treatment of cancers.